cooked it! What did I do wrong? This first! ---> ops: so this has been set up at 8-9 psi. Running 92 pump gas.. is it just a octane problem? timing? 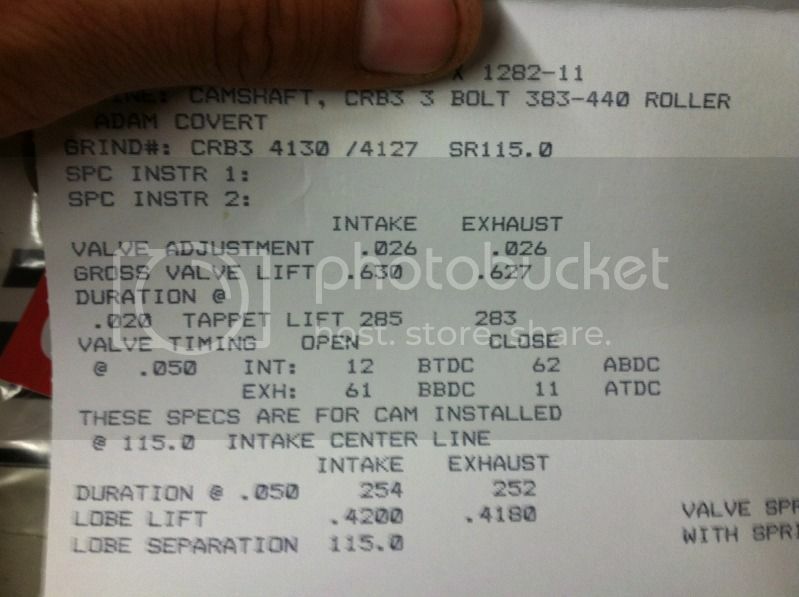 I think I have a picture of the map I have in the msd..
guess I know where the 3 tenths went also..
First thing I noticed is the marks where the valves smacked the piston ! What kind of shape was the head gasket in? I'm no expert but it looks like a lean burn problem. Maybe too much Timing advance? Just guessing here. Some one will jump in with better info. Wow never seen reliefs like that . They seem so shallow, doesn't seem like they would do much good if the valve did get close to the piston. Interesting. yeah The headgasket was blown and looks like it got hot between #4 and #6. It didnt swap fluids just ate the water. could be timing I am leaning to to much compression to Octane. I didnt know what my final ratio was till a friend showed me the chart on BDS's website. It shows a that my final ratio at 8 psi would be 12.5-13.2 compression. Thats if I am at the 8-1 I was shooting for initially..
Was that AFR from a wideband in the car when it happened? With a that piston @ +.060 you need chambers at least 90cc's to get close to where you should be. What was your combustion chamber volume? 92 octane pump gas can be all over the place as well. We are switching from summer to winter blend all over the country right now too. Sorry to see any damage like that. I was wondering what the hell happened to you? Looks like your timing was too high! Should have been around 24* total. I run a AEM uego so yes wideband. The pistons are a -30 dish. the heads are 78cc and I run a .062 copper headgasket. The pistons are in the hole a smidge.. the plugs are wet. cant remember what I have stated earlier on. but it blew a headgasket at some point. I dont know if this damage was before or after the HG blew. It didnt swap fluids just ate the water. Its totally possible that I made 6-10 more runs with it like this. The head shows some slight dings but they are all carboned over. I did drive it in the trailer and drov it in the garage.. 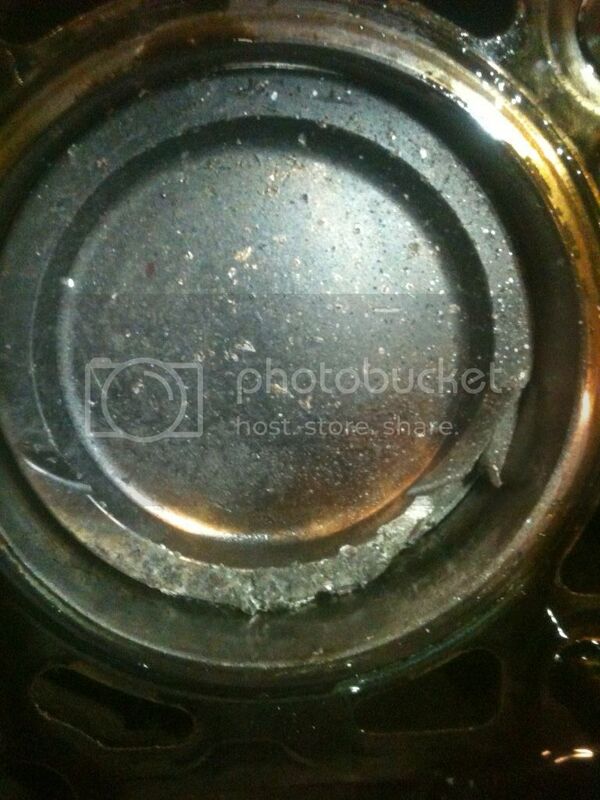 I initially thought it was just the HG gasket..
Torching like that indicates to me that that piston overheated. I see some shavings in there. Is that from disassembly? What were your coolant temps? I dont think the blown hg would cause toeching like that. Im leaning towards detonation. That's kinda where I was leaning too. I was probably closer to 30* plus the cheap gas. I need to check the map in the msd tomorrow so I know for sure. As for coolant temps it never gets over 185. Until my last pass it spiked to 210 for a second. That's when I found it was really low on water. Filled it and left the cap off while cranking it was blowing bubbles. Sounds like you had plenty of fuel. I know that probe piston has a dish. My chart shows about 9.5:1 with that piston & a 78cc head, unless you are really deep in the hole. Sounds like it is time to start adding 10% xylene or toluene to the pump gas - high compression turbos need plenty of octane. IMO from seeing damage like this before. The HG had to have been blown for a while. 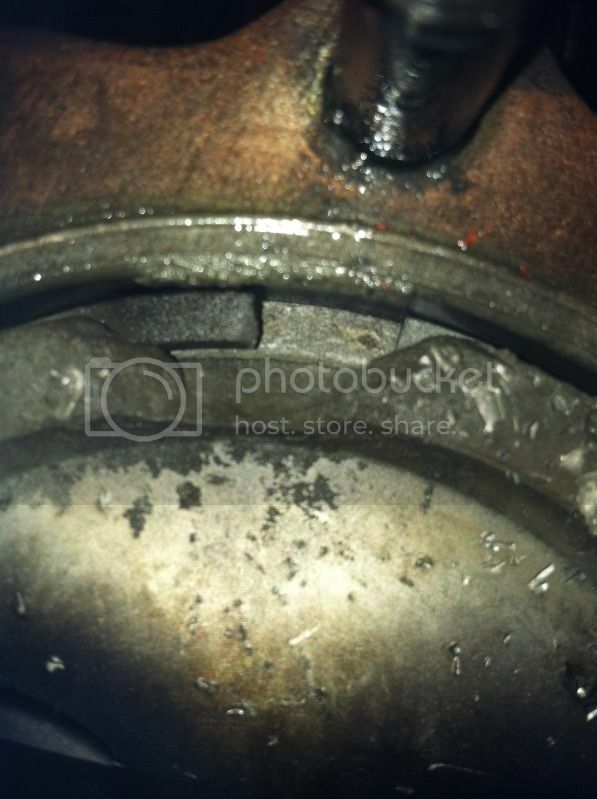 The Burning Coolant "ate" away at the piston. I've also seen blocks eaten away in similar circumstances. I still say Lean burn from too much advance caused the Heat/Pre-Detonation probably set it all off. Your compression isn't an issue with such low boost and 92 octane. I've found 15lbs boost on a 9.2 compression motor to be the safe limit on 93 octane. It wouldn't hurt to be running a meth/water setup though since you could always get some questionable fuel. If you want more info on that PM me. It sounds like your timing was too high and/or you got some lower octane fuel and detonation got the better of you. Lifted a head, blew a headgasket, and cooked a piston. fwiw- Been there..it sucked 22lbs boost, 93 octane + water meth injection. Found out water/meth is best left to 18lbs. After that I only used race fuel for anything more than 18. The meth helps but it doesn't mix with the 93 to make all the fuel higher octane. It just makes a higher average. "The engine used to be 7.7:1, but after talking to Don Bailey about it he convinced me to bump it to 9+ after I broke my crank couple years ago. Now it makes more HP and torque per lb of boost and still runs on pump gas. Having low compression leaves too much on the table and after switching proves it." I think he is making 1400+rwhp/1100rwtq@13,5 lbs of boost pm 94 Octane. k heres some picts of stuff for reference.. The piston. there are no loose pieces. Looks like melted aluminum at the top of the cylinder. also the ring is loose it isnt bound up. There is a pict of my plugs. This is after I drove it in the trailer and in the shop. also piston is in the hole .035 and I ran a .062 thick copper gasket.